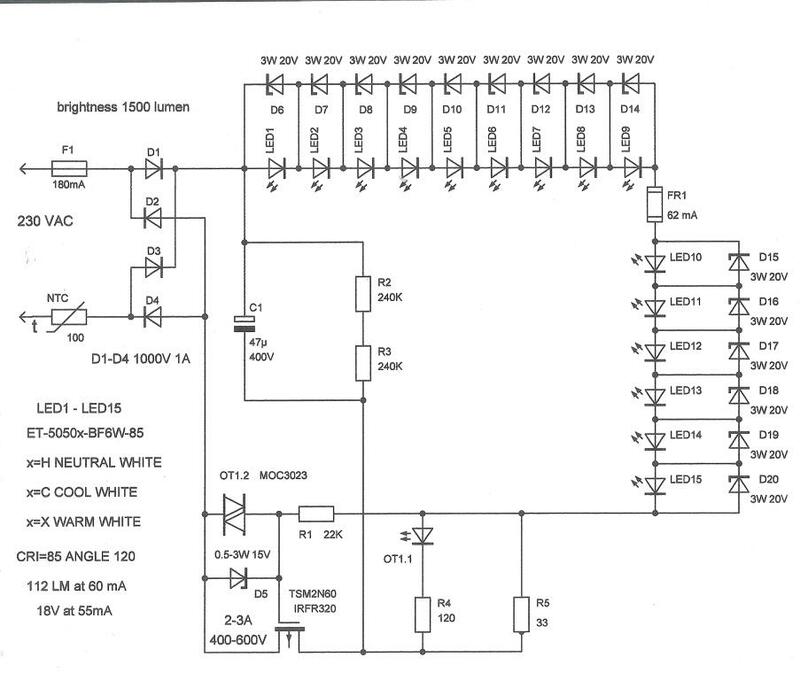 Due to the fact, that some manufacturers produce low quality LED lamps, we have decided to publish the schematics for our own high quality lamps, that have been tested thoroughly. It is possible, that the schematics have been thought up somewhere as well and are patented, but we must keep in mind, that they are still not distributed much. The FIG. 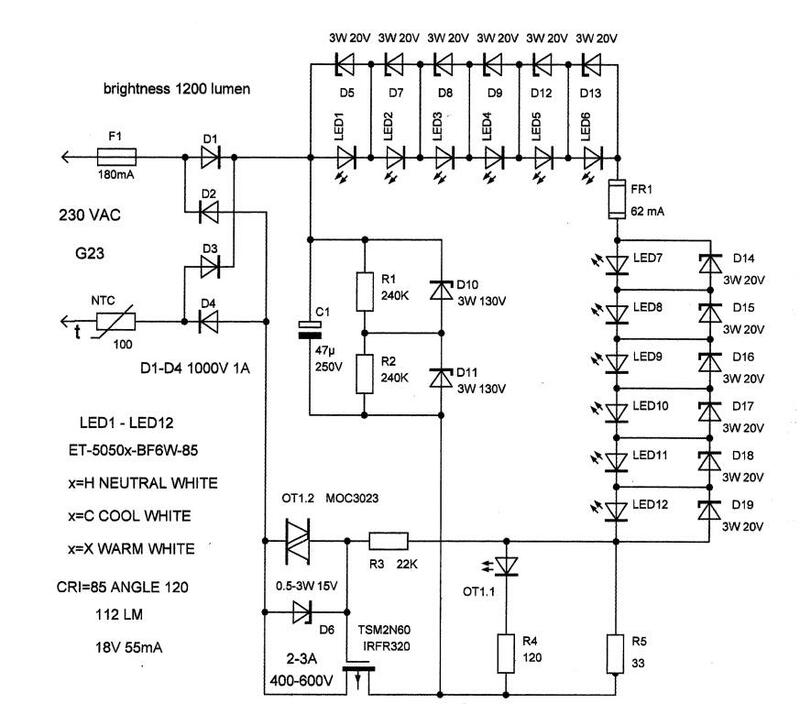 1 contains the schematics, which are used to manufacture low quality lamps. For lamp work at least some time , the current through the LED's set 50% of nominal. The current is not stabilized and the voltage spikes will increase the current above the norm, damaging the lamp. In the event of termination at least one of LEDs the lamp will not shine. In case the short circuit of one LEDs, the current of others increases and they all fail faster. In the case of use ICs, electrical parameters is better, but the reliability is low due to the IC and the transistor operates in the heavy-duty and damaged by voltage spikes and the a small driver board heat from LED . The price is higher because in addition to IC and transistor use ultrafast diode, special inductor with gap for LED and suppression inductor after the rectifier. We shows a decent schematic, a bit more complex, but reliable. In comparison to the cost of 12-15 LEDs the cost of additional parts in production is not significantly greater, while providing greater reliability. High reliability because with increasing voltage the transistor is closed and voltage spikes even up to 500 volts are not harmed. 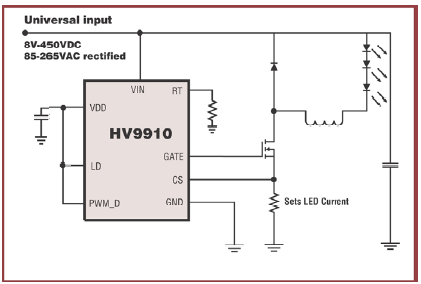 The current of the LEDs is stabilized and the main voltage fluctuation do not change the current in LEDs. In the event of termination or closure of even 10 LEDs, the current of LEDs will remain unchanged, leading only to a decrease in brightness. Since the circuit is not isolated from the mains, it is necessary to connect them through residual current circuit breaker. Instead of unavailable for sale LED ET-5050 maybe use Osram LED DURIS� S8 GW P9LMS1.EM with more better parameters.